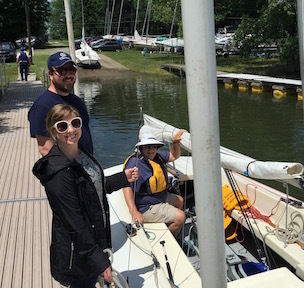 BYC offers beginner sailing lessons for adults at the Mahoning County Career and Technical Center (MCCTC) in Canfield, Ohio, every spring. This class consists of classroom instruction at the MCCTC, land drills at Berlin Yacht Club, and actual sailing on member-owned boats with experienced sailors. A book is included in the cost of the class. Classes start this year on May 2, 2017, and the class will meet four Tuesday nights, May 2 to May 23, as well as Saturday, May 20, 2017, from noon to 4:00 p.m. at Berlin Yacht Club.